Pavel Eljanov (Ukrainian: Павло Володимирович Ельянов, Pavlo Volodimirovich Eljanov; born 10 May 1983) is a Ukrainian chess grandmaster. He has won two team gold medals and one individual silver medal at the Chess Olympiads. He was one of Boris Gelfand's seconds in the World Chess Championship 2007, in the Candidates Matches 2011 and in the World Chess Championship 2012. Eljanov was one of Magnus Carlsen's seconds in the World Chess Championship 2013. In 1999, he was a member of the Ukrainian national youth team, which won the Under-16 Chess Olympiad in Artek, Ukraine. 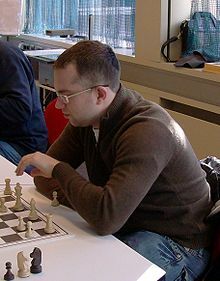 Eljanov won the 2007 Corus B tournament in Wijk aan Zee, the Netherlands with a score of 9/13. This result enabled him to qualify for the category 20 tournament Corus A 2008. In the latter he scored 5/13. He won the 2009 Bosna Chess Tournament, a six-player double round-robin tournament in Sarajevo, with a score of 7/10. In May 2010, he won the Astrakhan stage of FIDE Grand Prix 2008-2010 scoring 8/13. In August 2010, he won the Politiken Cup in Copenhagen. In the September 2010 FIDE World Rankings Eljanov had a rating of 2761, making him number 1 in Ukraine and number 6 in the world. In February 2012, he tied for 1st-3rd with Mateusz Bartel and Anton Korobov in the 11th Aeroflot Open. In February 2013, Eljanov took clear first place in the strong Reykjavik Open. Later that year, in September, he won the 14th Karpov Poikovsky International Tournament, a category 18 round-robin, scoring 6/9. In the following month he won another strong open tournament, the Chigorin Memorial. In April 2014, he won the B tournament of the Gashimov Memorial in Şəmkir, Azerbaijan. His father was International Master Vladimir Eljanov. In April 2009 Eljanov married WIM Olena Dvoretska. He has a daughter born in 2011. Eljanov graduated from the National University “Yaroslav the Wise Law Academy of Ukraine”.